Includes the ruins of a cathedral, seven churches, two round towers, three high crosses and the largest collection of Early Christian graveslabs in Western Europe. Clonmacnoise is an Early Christian site founded by St. Ciarán in the mid-6th century on the eastern bank of the River Shannon. The strategic location of the monastery helped it become a major centre of religion, learning, craftsmanship and trade by the 9th century and together with Clonard it was the most famous in Ireland, visited by scholars from all over Europe. Artisans associated with Clonmacnoise created some of the most beautiful and enduring artworks in metal and stone ever seen in Ireland, with the Clonmacnoise Crozier (on display in the National Museum of Ireland) and the Cross of the Scriptures representing the apex of their efforts. 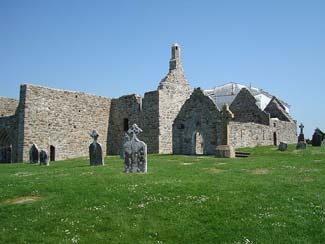 The Clonmacnoise site includes the ruins of a cathedral, seven churches, two round towers, three high crosses and the largest collection of Early Christian graveslabs in Western Europe. Most of the churches have recently undergone comprehensive conservation works, mostly re-pointing. Open Daily year round (closed 25&26 Dec); November-mid March 10am-5.30pm; mid March-May 10am-6pm; June-August 9am-7pm; September-October 10am-6pm. Last admission is 45mins before closing.